Katie’s Cards Announces First Earth Day Ecard and Charity Donation in Response to Shocking Statistics About the Levels of Deforestation in Brazil. In the lead up to Earth Day, Katie's Cards has announced that it will be unveiling its first Earth Day Ecard. The company prides itself on its eco-friendly service and has decided to take action in light of shocking statistics about levels of deforestation. Hopefully, each time our new Earth Day ecard is sent, it will increase awareness and will encourage people to find their own way of helping this vitally important cause. Being passionate about providing an eco-friendly service, online ecard retailer Katie’s Cards plans to expand upon their reputation in the lead up to Earth Day on April 22nd. In response to the latest statistics about deforestation, Katie’s Cards has unveiled its plans for a new Earth Day ecard, the first of its kind on the company’s website. It has also made a pledge to plant ten trees in the Brazilian rainforest and is encouraging its members to follow suit. The Katie’s Cards team has been shocked by the disastrous effects that deforestation is having on the environment. The Amazon rainforest is often called the “lungs of the earth” and the survival of thousands of species of birds, plants and animals, as well as humans, depends on its preservation. The tropical rainforest once covered fourteen per cent of the earth’s surface, it now covers only six per cent with the decline attributed to high levels of commercial logging, unsustainable farming and cattle grazing. 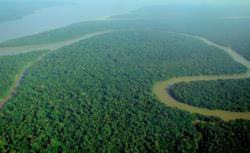 More worryingly, some experts predict that within the next forty years, the Amazon rainforest could completely disappear. Seventy per cent of world’s plants and animals rely directly upon the rainforests for survival and the current levels of destruction would lead many species to extinction and would drastically decrease biodiversity. Katie’s Cards CEO Katie Davies emphasized that Earth Day must play a vital role in galvanizing public opinion to make sure that people do not ignore the pressing environmental issues. Earth Day has been one of the main events in the ‘eco’ calendar since the 1970s, when its inception signaled the start of the modern environmental movement. It is estimated that over one billion people around the world will take part in Earth Day events, including fundraising and awareness raising on a variety of environmental issues including climate change, healthcare and education. All of the ecards available on the company’s website are eco-friendly as no resources are needed to produce the cards and they don’t have to be transported by air, land or sea to reach the recipient. In fact, the ‘green’ nature of the ecards makes them an attractive marketing tool for corporations who are trying to decrease their carbon emissions. Since Katie’s Cards started offering corporate ecards in 2009, the number of corporate customers has doubled each year. These figures can be attributed, at least in part, to the growing pressure on companies to be eco-friendly. Katie’s Cards has also announced that it has made a donation to plant ten trees in the Brazilian rainforest as part of the Plant a Billion campaign. The company, who are due to announce this donation in their May newsletter, aims to encourage its members to do the same and to play a role in countering the disastrous effects of deforestation.